Nepali Recorder Journal. Handmade in Nepal with Lokta Paper. | Kathmandu Valley Co. The Nepali Recorder Journal is the perfect blend of tradition and style. Handcrafted in the Himalayas and used anciently for sacred texts, lokta paper has been a staple of Nepalese artisans for centuries with the oldest known text on lokta paper still preserved after more than 1,000 years. The paper comes from lokta bushes which grow on the southern slopes of the Nepali Himalayas between 5,250 and 13,000 feet. When properly cut, the bushes can produce three to eight new fast-growing shoots making Lokta paper one of the most sought after non-tree papers. The paper is not treated with chemicals and is hand made in rural villages in the high altitudes of Nepal. The fibrous bark is “cooked” into a pulp that is hand applied to screens and sun dried curing into the pages used in this journal. The imprint left from the screens can still be seen and adds a beautiful texture unique to the paper which contains natural flecks from the outer bark and can vary slightly in thickness from page to page due to the unique handcrafting process. 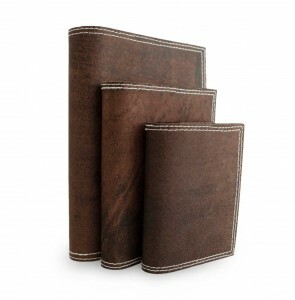 Water buffalo leather, vegetable tanned, provides a durable and unique look and feel for each journal. 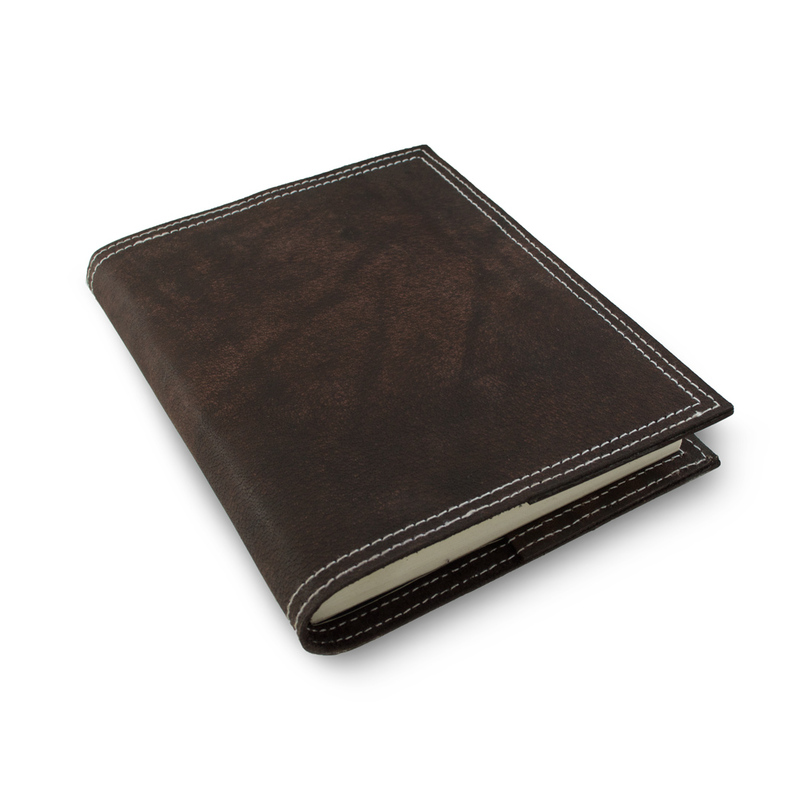 The side stitching adds a beautiful decoration to this refillable journal. The perfect note-taking companion at home, work, or for your adventures and journeys around the globe. Capture your memories, thoughts or sketches on the 98 unlined sheets (196 pages front/back). 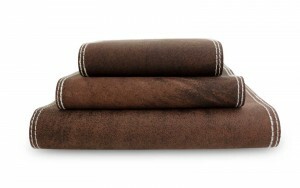 The stacked set of three look wonderful on a table or shelf. A Himalayan handcrafted treasure that supports the talented Nepalese artisans and preserves the thousand-year-old tradition of hand made paper in Nepal.